Global Name Lookup check who owns each webname. Charges - Details of our In-House and Call-Out repair charges. Sunrise Computer Systems specialise in all aspects of Internet technology, web design and hosting, computer installations and maintenance. Consultants for Voip and computer controlled PBX office telephone exchange using asterisk and linux technology. Don't want an off the shelf PC with Windows 8 or 10? In response to many clients wishing to replace their faithfull XP machines, but wary of Windows 8 we have added our Custome PC Builder where clients can select all aspects of their new PC, including Windows 7 operating system. With the helpful instructons video it couldn't be simpler. Online Backup - Protecting data on a PC or laptop need no longer be painful. Our online backup for PC automates the process of backing up critical data, removing manual copying to disk or tapes. Web Design - We offer realistic and cost effective solutions to your web design requirements from basic domain holding pages, small information web sites, to large and complex interactive web solutions. Web Hosting - Domain name registration, 35mb hosting and unlimited e-mail addresses from only £11.75 per month. 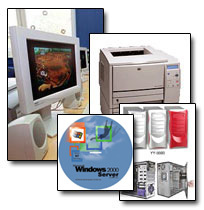 Computer Sales - We supply a variety of computer systems tailored to your requirements, as well as individual items such as printers, scanners, hard drives, etc. Computer Repairs & Maintenance Contracts - Our trained and experienced engineers can diagnose and repair most makes of computers. We can offer a fully inclusive maintenance contract to cover all mechanical breakdowns ranging from individual computers, to a full network system. Domain Name Registration - Even if you are not considering a web site at the moment, we can register a domain name and hold it until such time as you decide to proceed. Computer Consultancy - We can reassess your current computer setup or advise you on a suitable computer system, ensuring optimum efficiency is maintained. Networking - Our trained and experienced engineers can network your existing computers together to allow shared printers, shared Internet access, etc.